It’s the sweetness that lead to the success of this Filipino brand of wine. Check every corner of Manila and one can sure see a group of men with a table setup ready to drink their daily dose of alcohol in the forms of beer or gin. While drinking has become second nature to Filipinos, wines—a taste as old as Jesus—remains a special commodity for many. Enter Vicente Quimbo, founder and CEO of Bel Mondo Italia, the genius behind the affordable line of local wines, Novellino. In 1999, even when he was well aware that the local market remains foreign to the fermented drink, Quimbo spent the next decade intoxicating Filipinos with the sweet taste of success. 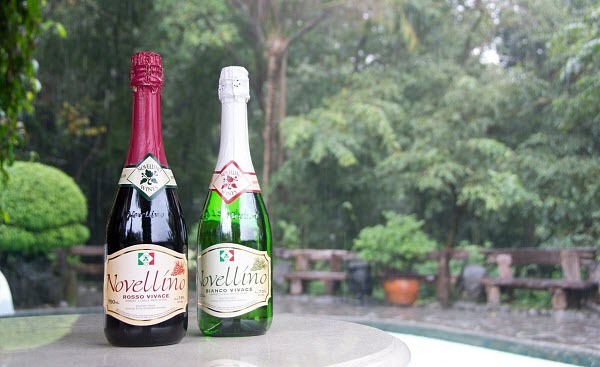 To capture the Filipino drinker, Novellino focused on creating a sweeter variant of wine, more than the usual sold by international brands. “With Novellino, instead of importing wine, we imported grape juice as a commodity because wine is essentially processed grape juice which turned out cheaper for us,” Vicente told Forbes Philippines on its June edition. This gave the winery a leeway to experiment on how it will craft its concoctions, but maintaining the same quality of higher-priced brands. To ensure it, the company only purchases grape juice from countries known for producing the best vines: Argentina, Chile, Italy, and Spain. “We do partial fermentation to retain sweetness. Our bestselling wines are those with 4.5% alcohol content. That’s the magic number,” Vicente’s son Christopher explained. Cheaper production costs let the company price their products at P300 ($6.40) per bottle for its red and white wines, while one of their best-sellers, Sangria Novellino, retails for P200 ($4.27) a bottle. Such positioning let the company acquire the biggest market share locally, with 26.3% of the total sales volume of light grape wines credited under its name, Euromonitor reported in 2013. Revenues also grew by a record P280 million ($5,977,720) in 2015, surpassing the company’s previous high of P263 million ($5,614,787) in 2013. From right: Vicente Quimbo with his son, Christopher at a vineyard in Italy where they source their grape juice. They are joined by the owners of the site. Its friendly price gave the brand a following among young adults who wish to treat themselves with some luxury without breaking the bank. This means aggressive advertising, from sponsorships of local events to strong social media presence. “About 50% of our population are 24 years old and below so we have a young, hip crowd—millennials who want to drink wine but who don’t want to spend too much,” Christopher said. Since 2013, the company has been strategic with its marketing strategies, with Christopher admitting their advertising budget “probably” accounts for 75% of the total ad expenditure of the whole industry. The company boasts more than 500,000 followers on its Facebook account and now has 93% brand awareness. But with its popularity among the young is the deference of the upper-class market, with some restaurants and hotels even refusing to carry the brand. This is even after the company introduced imported premium wines with higher alcohol content of 12.5% such as Novellino Cabernet Sauvignon and Merlot. Vicente said their imported wines are sourced at the same company “of a British brand that sells wine at P1000 ($21.35) a bottle,” yet the company price theirs at P400 ($8.54) each. “It breaks my heart that some Filipinos still think that homegrown products are inferior,” Vicente said. Instead of bottling his disappointment, Vicente is setting his eyes on expanding abroad with the overseas Filipino workers in mind. The brand, with 16 wine variants under its name, is currently distributed in select locations in North America, Southeast Asia, and the Middle East. “We’re aiming to be the first [company] to have that 1% [market share] of the wine market,” Vicente said. Elyssa Christine Lopez is Entrepreneur.com.ph’s editorial assistant / staff writer. Follow her on Twitter @elyssalopz.